An Olympic class boat, the Laser is sailed and raced throughout the world. The International Laser Class Association maintains very strict one-design rules, which enable the older well-maintained boats to remain competitive with newer boats. Laser Fleet #24 is part of ILCA District 18. 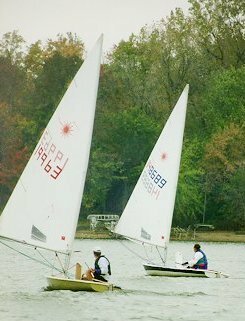 Laser Fleet #24 hosts a Spring Regatta each year that typically attracts sailors from all over Indiana and each of the surrounding surrounding states. Over the last few years we've averaged 20-30 boats. In 2018, the regatta was shifted from mid-April to mid-May, and is now known as the Windy 500. The Indy Laser Fleet owns a Laser, named "Ruby", equipped with a Standard and Radial rig. If you'd like to sail it, talk to the fleet captain to arrange joining the fleet as an associate member. 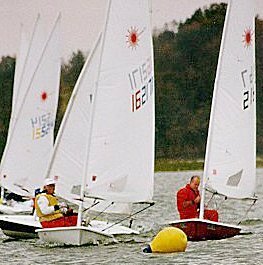 The Laser is a good choice for juniors, as with it's three interchangeable rigs, the 4.7(m2), Radial (5.76 m2) and Standard (7.06 m2), the sail area can grow with the sailor, needing only new lower mast sections and sails. The Radial is the women's Olympic single handed class, and many lighter men sail Radials as their first choice, or swap into them when the breeze picks up. For more information on our Laser Fleet, feel fee to contact Paul or Ellen.